The What: ZeeVee’s HDBridge3000 is now commercially available and being implemented in the broadcast, hospitality, and healthcare markets. 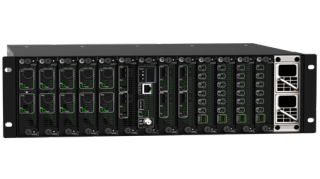 The What Else: The HDBridge3000 is the newest product offered by ZeeVee delivering a high-density, small-footprint system to distribute HD and SD video throughout client facilities in a compact, 3RU chassis. The Bottom Line: With the convergence of AV over IT, and the growing demand for 4K video, ZeeVee is taking an innovative approach, engineering new technologies that bring the same ease of use as their current RF platforms that are already in use worldwide. ZeeVee’s new technologies aim to challenge conventional, and often proprietary, distribution systems, providing integrators more flexibility and scalability to future-proof their end-customers’ investments.